firefighters and soldiers. Science writer Henrik Bendix explores some of the exoskeleton options that are being developed. Additional reporting by Laura Boness. Amanda Boxtel was told she would never walk again after a skiing accident left her spinal cord partially severed. But in 2010 she was able to take her first steps in 18 years, with the help of the eLEGS exoskeleton. And, just like her, many paraplegics may soon be able to wear a pair of robotic legs to help them walk upright and even move up and down ramps and stairs, making wheelchairs just one of the many mobility options available in the market. With the help of these artificial exoskeletons — external skeletons made of lightweight materials strapped to the body — the users can move their limbs by operating small, computer-controlled motors strapped to their knees and hips. Models such as eLEGS from Berkeley Bionics in California, US, ReWalk from Argo Medical Technologies in Israel, HAL (Hybrid Assistive Limb) from Cyberdyne in Japan, and Rex (Robotic Exoskeleton) from Rex Bionics in New Zealand are currently sold or rented to hospitals and rehabilitation facilities. In 2011, Rex was approved for sale in Europe. Its initial price is about $130,000 dollars, although it is expected to drop this year to $110,000 — the ultimate goal is to reach the same price of an advanced wheelchair. “A paraplegic is a good example of someone who might benefit from this, but they’re not the only ones,” says UTS robotics researcher Nathan Kirchner. Exoskeletons can help adults with spinal injuries, including paraplegic patients with leg paralysis and those suffering reduced mobility because of conditions such as spina bifida, multiple sclerosis and cerebral palsy. For minor injuries, the patients could reduce rehabilitation times by compensating for the injured muscles and enabling them to heal without putting further strains on the body. There are other groups that could benefit from this technology, such as the elderly. As populations age, artificial exoskeletons may help individuals who are 70 or 80 per cent capable of carrying out a task remain completely independent. The military, athletes and sports research organisations are also potential candidates, as the exoskeletons can supplement the body’s current capabilities, allowing the person to walk faster, lift heavy weights and push past the pain boundaries. Users of the exoskeleton models marketed today must have a relatively healthy skeleton and a well-functioning circulatory system in order to be able to stand and walk with the assistance of the mechanical legs. Moreover, they must be able to use their upper bodies, as three out of four models require crutches. Every system of the body is affected by spinal injuries, as the body’s gravity changes when it is sitting down all the time. By standing and walking, rather than using a wheelchair, bladder and bowel function improves, reducing the risk of infections and kidney stones. Gravity also assists breathing and lowers the risk of respiratory infections. The movement also aids blood circulation, and frequent use of the exoskeleton can prevent pressure ulcers and muscular atrophy — both are common conditions among wheelchair users. The risk of osteoporosis decreases because the bones and muscles are in constant movement. The technology is still evolving and some of the early models are slow, rarely attaining a normal walking pace. The only exoskeleton that doesn’t require crutches or a walker is made by Rex Bionics. A number of sensors connect to a computer, which constantly sends signals to the robotic leg motors, keeping the body balanced as the robotic legs walk or move up and down stairs. Rex is controlled by a joystick, through which users instruct it to get up, stand or walk. The eLEGS and ReWalk exoskeletons, on the other hand, have sensors connected to a computer that constantly tries to interpret the user’s intentions and move the legs accordingly. If the user is standing up and changes his centre of gravity by leaning slightly forward, it is interpreted as a sign that the robotic legs should start walking. And when the user leans slightly backward again, the legs stop. 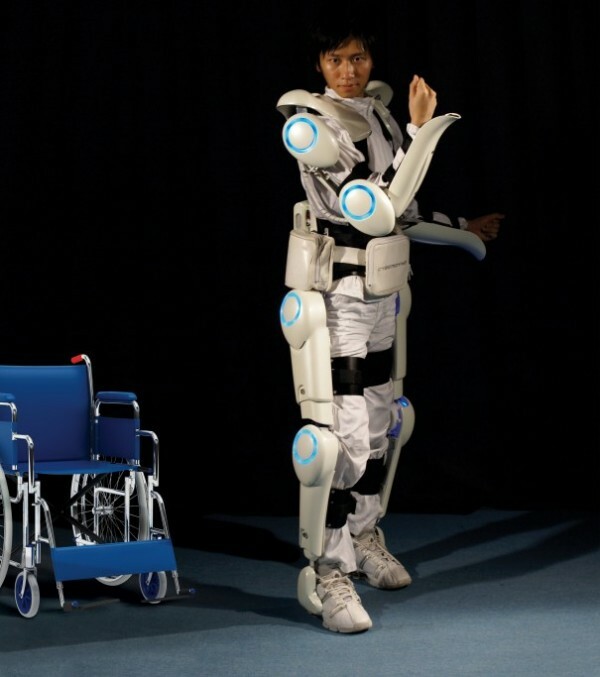 Users quickly learn to control the exoskeleton in this way, making walking look quite natural. The patients must be able to push buttons, though, which are necessary to tell ReWalk to walk up or down stairs; eLEGS doesn’t have a stair function yet. In Japan, scientists have taken this technology one step further and developed special sensors that sit on the skin, registering the weak electric signals that the brain sends to the leg muscles via nerve paths. HAL [pictured on page 67] is consequently able to copy movements that the muscles would have made were the user not disabled. However, the sophisticated HAL system only functions if there are any signals to interpret. If the nerve links have been severed, HAL functions as a programmed robot, but it is paving the way for future exoskeletons, which could be used by paraplegics as well. The Walk Again Project is currently working on a brain-controlled exoskeleton that will restore movement to patients with severe paralysis. Their goal is to create a “˜wearable robot’ that works as an extension of the body. Although the researchers usually collaborate with the future exoskeleton users, the fact that the equipment is being developed in a laboratory remains a challenge. The model may not always meet the participants’ expectation, as what the researchers believe they need might not be what the users actually require. “The lab is a very, very different place from the real world,” Kirchner says. “The biggest challenge is successfully connecting with the real world and the people that we’re trying to help. This article was published in our March/April 2012 edition; order back issues here.